We are very happy to announce that after a long period of development we have just released Twproject 5.4 (build 59600). This new release includes a relevant redesign of the interactive Gantt chart, moreover we improved the interface usability of the entire application, fixing most of the bugs signaled through our support forum (thank you!). This release also contains a major internal refactoring focused on providing better access to Twproject trough an API that will be released soon. Some additional fields have been added on the database schema, now supporting custom fields on resources; it is also functional to maintaining custom orderings in Gantt chart. As usual the upgrade procedure will perform all necessary steps automatically. The new interface has been rebuilt using HTML5 and SVG, giving to our users a brand new usability experience. We lets you navigate the grid using your keyboard, in this way editing and creating task will be much easier. We also introduce the fixed header to help users interact with complex trees. 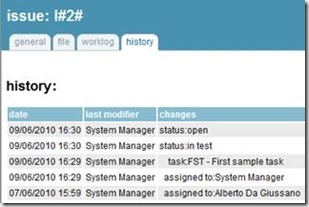 Task and dependencies can be selected and removed directly from the chart side. The Gantt chart is now really easier to use. You can manually link projects creating dependencies, task names are displayed beside each task, task days are shown while you are enlarging or reducing tasks. 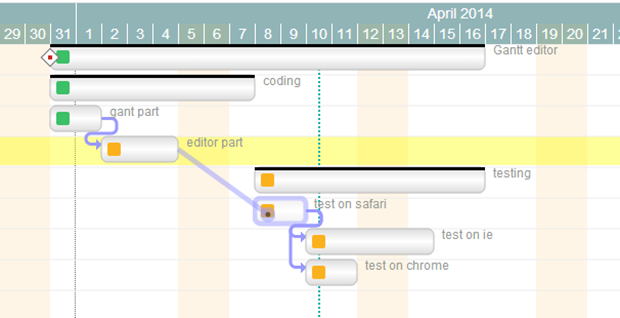 The new Gantt editor also includes critical path identification. Critical path computation can be turned on and off and is updated automatically with your tree changes. We think that team communication is essential for task progress and for this reason we enhanced discussions’ strength giving new visibility to this feature. Now is easier to create conversations and contribute. Users can initiate a new discussion on each task, so that will be easier for workgroups to discuss about specific task matters. Subscriptions and notifications keep your group up to date. Minor changes and a really nicer skin. Redesigned Copy task feature for a more intuitive cloning procedure. Since Twproject 5.4 you have direct access to Twproject shop in order to easily increase you number of user licenses or update your license expiry date. The new license will be generated and sent to you within few minutes. If you are using our cloud solution, your environment will be automatically updated. We are also very proud of our new Twproject website released last week. We worked really hard to make all information about our software features available to customers in a simple and intuitive manner. Buying Twproject is now more simple and fast, licenses are sent to your email address immediately after purchase and Amazon dedicated Instance are instantiated automatically too, in a few minutes. We completely redesigned our guide that is now a dedicated site to help all our acquired customers finding answers on their work management problem. The work documented in this post was ignited by receiving the first video tests from usertesting.com and other sources (by the way, Usertesting supplied valuable feedback for a very cheap price), and about at the same time watching a video where Amy Jo Kim from Shufflebrain does a great and inspiring presentation showing how some game mechanics are used by successful social software. But our internal speculations lacked the ideas that may come from an independent fresh look; we received a lot of positive feedback from new users of Teamwork 4, but the problem is that those that do not understand your software, don’t usually give you feedback. 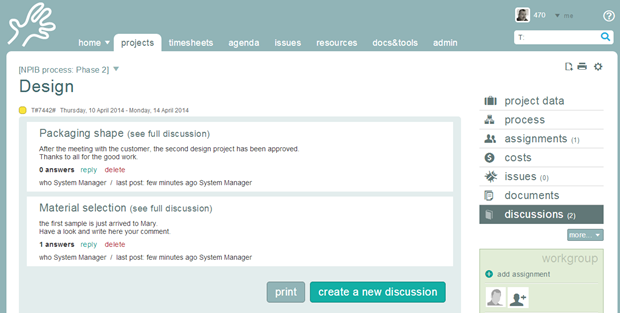 So we submitted Teamwork 4.1 to several testers that were first-time users. Then, looking at the testers’ video, these were full of surprises, and quite… painful to watch! Poor users! Putting together feedback of the testers and the idea of the prime importance of positive feedback from the software, in particular in early usage phases, we designed a new release of Teamwork which we hope should be friendlier for both the first starter and the daily user. Here we document some of the differences. I hope that being this a concrete example of usability evolution, it can be of some interest for those who are working on web application usability in general. This is filled with interesting ideas and observations; to me what results more interesting is not so much the extrapolation of the specifics of game mechanics, but looking at ways to involve with feedback the user in its first steps in your application, and then guide the evolution of it. It is clear from the speech and Q&A part of the video that she has a wide usage and behavior culture which is only partly expressed there. Looking at human beings as reacting to behavioral stimuli is taking an extremely partial view, which has little explanational mileage, but not zero. It is true that games tap in primal response patterns; but that is also their limit, at least for games that use proximal metaphors (body movements) and not reasoning, collecting, quantifying. Collecting and quantifying means inserting strings and numbers; something at which Mario Bros. like interfaces are vary very bad at; like using the iPhone keyboard for a lot of data input. But collecting and quantifying is what is most important for a huge number of applications, and where the proximal metaphors simply won’t help. In playing games, often the player is happy to use “low level” skills; in planning work, not so much. That is also why simple stimulus – response – reinforce metaphors can be effective in gaming, advertising, but not elsewhere; we are not (fortunately) always that stupid. It is surely false that the most powerful way to manipulate human behavior is to do a variable response schedule: a good argument to a responsive crowd can do better than any behavioral proximal stimulus. But that would take us far, on the failures of behaviorism (this is old stuff from the 50’s). Still, when the users of any software are in their first steps, the response patterns of the application matter a lot. On the Business of software discussion group I’ve recently seen a discussion on a tool for visually collecting bookmarks. The developers chose to develop a desktop client before developing a browser plugin (! ); this to me is a clear mistake in adoption path strategy, which does not consider the critical point of lowering the adoption path as much as possible for such a secondary tool. Seeing collecting bookmarks as a “game played in the browser”, makes it immediately that the separate client idea is disastrous! My point of this section is just that the gaming metaphors can help, but in limited forms and cases. (1.5 MB – lots of screen shots). N.B. The changes to which we refer are not released yet (May 13th, 2009); the demo and the downloadable version are those before changes, the new release (Teamwork 4.2) will be available in a couple of weeks.